Cash vs accrual accounting: cash is not the same is profit! You’ve monitored company financial performance as you’ve built the business. What methods have you used? For some, this could be as simple as keeping track of the bank accounts. Other business owners might employ formal accounting and bookkeeping systems such as QuickBooks, Fresh Books, Wave and many others. Or, perhaps your company employs a CPA or accounting firm. How do you determine if your company is making money? The larger the business, the more challenging this becomes. Unless you are trained in the business of accounting and finance, you likely do not use formal accounting methods (which will be employed by professionals conducting due diligence when you sell the firm). If so, this article is for you. Even if you employ professionals, you need to understand basic information in order to fully grasp and act on your company’s financial performance. Let’s begin with the two most popular financial reports. There are two key standardized financial reports required to measure business performance. The first is called a Profit and Loss Statement (often referred to as a P&L or Income Statement). P&L measures financial performance over a period of time, such as a month, quarter or year. And the second is the Balance Sheet, which measures financial position at a specific point in time such as end of month, quarter or year. The P&L shows whether your company is making money over a specified period of time by looking at all of your revenues/sales less all of your expenses. What remains is either profit (your revenues exceed expenses) or loss (your expenses exceed revenue). As the name implies, the Balance Sheet looks at balances of various accounts such as bank accounts and inventory, plus accounts that you are owed as payments from customers (accounts receivable) and those that you owe your suppliers or vendors (accounts payable). The Balance Sheet typically shows whether your company is solvent, meaning it has more assets (cash and receivables) than liabilities (bills and debt). It should be no surprise that while these two reports are the standard for reporting, how the reports are tracked and compiled is more complicated but just as necessary to understand. For this article series, we will focus primarily on the P&L Statement as the better choice to look at. Business owners need to understand the fundamental difference between cash and accrual accounting. Cash basis accounting in simple terms means keeping track of what and when cash comes in versus what and when cash goes out. If you are not “accounting inclined,” forget phrases or reports such as Statements of Cash Flows. That is not to say this report has no value, but the method by which accountants will compile this information can be confounding and confusing. With accrual basis accounting, what’s important to understand and be able to forecast is if you will have more money coming in (or in reserve) than what you will need to pay out to employees, suppliers and creditors to stay in business. To do this, you must be able to anticipate when customers will pay you. Depending upon your business, this can be challenging to predict but you must have some idea as to when you will be paid for your product or service. Easier to control (because you have invoices with due dates) is when your bills must be paid. Once you have a picture of what’s coming in and what must go out and the timing of these two recurring events, you’ll put together a profile or plan that looks to the future for at least three months. Typically organized in a digital spreadsheet (e.g., Excel), this can be also done on paper for those who are digital-spreadsheet challenged. Digital or paper, you’ll predict with reasonable certainty your future cash flows. This will help you anticipate cash shortages and, if your cash flow is positive, it may enable you to decide if and when to reinvest money into the business without jeopardizing your ability to always make ends meet. If your accrual-basis cash flow spread sheet shows that you are not always making ends meet — your cash going out exceeds the amount coming in for a given period or periods, this can happen for a variety of reasons. It could be a symptom of timing. For example, some businesses don’t receive payment for 90 days after presenting an invoice to their customer. That business will likely have to pay vendors and employees more quickly than 90 days and the result is a timing difference of cash-out versus cash-in. This is why it is so important to understand the dynamic. If this is the case for your business, you might have to borrow from a bank (think line-of-credit) or lend your business money to bridge the gap. Once you bridge that gap, you should be able to make ends meet month-to-month. For tactics that help you deal with slow-paying customers, read this advice from QuickBooks. There might be another, more serious reason that your business is failing to consistently make ends meet. And, you need to identify it quickly: the business is not profitable. Accrual based financial reporting is your best tool to identify this as an issue. Accrual based accounting involves the matching of expenses with revenue (i.e. the product or service) those expenses generate. 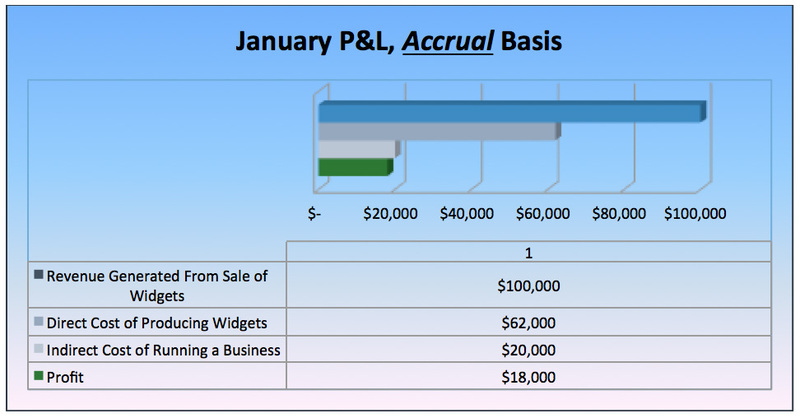 Simply put, if you make widgets and one sells for $100, accrual based accounting identifies ALL the costs that go into making it. As long as your all of your expenses are less than the selling price, in theory you will make money. If your business provides a service (not a product), the same principle holds. For example, if your business involves the mowing of lawns, a direct cost would be the salary of the employee doing the mowing. Other direct cost may include gasoline for the mower. The reason for tracking revenue and expenses in this manner is to determine whether your company is making money. For example, let’s say you pay your mower $8/hr and it takes him three hours to mow a lawn. You charge your customer $50. You might be thinking you are making $26 on this job…but hold on. You also have to pay for gas, oil and possibly the transportation it takes to get the lawnmower and mower to the customer site. Let’s say you calculate all of that to be an additional $10. Now your total direct costs are $36. In theory you are making $14 of profit (but see below). The problem this model presents from a cash perspective is this: you may have to pay your mower, the gas, oil and transportation all on the day the job is done. But you don’t give an invoice to your customer until the end of the week and it might take them a week more (if you’re lucky) to make payment. Now your cash out occurs prior to your cash in. Because of the timing of when cash comes in and when it goes out, keeping track on a cash basis makes it nearly impossible to determine one’s profitability. Now, a challenge of accrual accounting involves tracking those expenses that are not specifically associated with the making of your product or service (i.e. the widget). These include electricity, rent, insurance and any employees who you pay but who are not actually involved in the making of the widget itself (e.g. accountants, HR, maintenance). This leads us to the next topic. To get to the answer of whether your business is making money, you must be able to track ALL costs that go into generating your service or product as well as those involved in running the business. The specific costs that can be identified with the creation and production of your product or service are called direct costs. Using our mowing example, we identified that the total costs directly associated with the mowing job are $40. But what about items such as business and auto insurance, business license, bank fees, cost of preparing invoices to customers and postage if you still mail invoices? These are still costs but because they don’t directly relate to the work you do (mowing lawns) they are called indirect costs. These cost are indirectly attributable to the generation of revenue. And they are directly required for the overall operation of the business. It is important to understand the nature of these costs and how they impact the overall profitability of your business. Clearly, if your revenues are just covering your direct costs, you’ll have a problem. Revenue must also cover indirect costs. It’s important to identify indirect costs and account for them in a manner that makes sense for the running of your business. The accounting must yield an accurate picture of profitability (which I plan to cover in some depth in a future article). With this information in mind, it’s time to merge accrual vs. cash accounting with recognition of direct vs. indirect costs. Let’s say you have started a business in January (forget startup costs for now). Now, again for simplicity, assume all of our indirect costs for rent, utilities, insurance, bookkeeping, salaries etc. are paid in the month of January and the total indirect cost is $20,000. Obviously, cash basis accounting produces an erroneous view because $100K is going to arrive in the company’s bank account within 60 days. Now, on an accrual basis, you recognize revenue when earned (or generated), not when paid; and you recognize expenses associated with the generation of revenue at the time the revenue is recognized. In this case, your Profit and Loss Statement might look more like the following. You can do the math for the same spreadsheet in March, assuming no other sales. Revenue grows to $100K. After $82K in direct and indirect costs, Profit pencils out at $18,000. No red ink! All else equal, this reflects a profitable business. You would still have the cash challenge to fund your business until your customers pay their invoices. Over the long haul, this shows you are making money. 2) Cash Flow: Is the timing of when cash comes in versus cash going out such that you need to borrow or fund your business over the long-haul? Are you generating sufficient cash to maintain operations without continuing to borrow or fund your business? These examples are very simple. As a business grows, complexity grows, too. There are many variable and scenarios that an owner will need to understand. There are also more aspects involving funding and keeping track of your company’s financial condition than we’ve discussed. But, this is a good start that provides you with the basics. In the next installment, we’ll discuss the Balance Sheet and its role in helping you run your business. Then, we’ll bring analysis of the two parts of the series together to complete the picture of your business financial health and what you must know to mount a productive exit strategy. Need help understanding your financials, profitability and forecasting what’s ahead? Contact EndGame Success for a free consultation. An action guide for any business, at any stage, to improve the value of the business. Do you want to read more articles like these? Sign up for our newsletter today.